I've decided to make January fire month! What an awesome name for a month. I love fire! In keeping with the theme for the month I am doing a short series on pre-made tinder. This is part 4. Wet wood is the bane of building a fire. Wet wood, especially wet tinder, is very difficult to light. Unfortunately, you need a fire most when it is wet. A fire can dry yourself and your clothing, and it restores the warmth the rain robs. If it has just begun to rain then chances are you can find some mostly dry wood. If it has been raining a lot, or the rain is heavy, it just may not be possible. So how do you light a fire with wet wood? There are a couple of ways, but a candle gives you the best shot. To test this method I first soaked a pile of wood. The best kind of candle for lighting a fire is about three inches long and about an inch wide. Many survival web sites recommend birthday candles. Birthday candles do not work well because they only burn for a few minutes. When lighting wet wood you need to have a flame that burns for a LONG time. Also, stay away from the tea light candles. They are a great inclusion in your survival kit, but are not best for lighting a fire. You need the flame to rise high, touching the wood. in a pinch, tea light candles are better than nothing. I built the fire using the method described below. Imagine the boards are rocks or logs. Candles have a lot of benefits. They burn for hours and are 100% waterproof. You could store them in water if you wanted! They can double as a light source and a heat source. A simple flame from a candle can go a long way in keeping you warm. Like all tenders, they have drawbacks. The biggest drawback is that they are easily blown out. Much planning must be made into building your fire so that the candle is protected from wind. Another drawback is that they need an open flame to light. So you need matches or a lighter. At this stage you have to guard the flame. It blew out on me twice. There is a technique to using a candle as tender. You need to build a wind proof barrier around your fire. Do this by building a wall out of sticks, logs, rocks, or dirt. 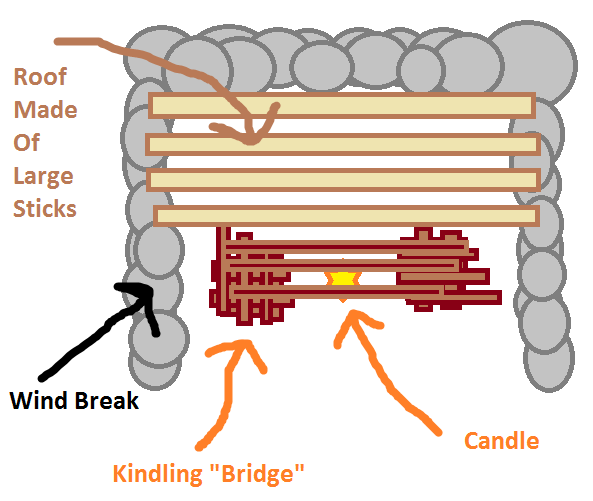 Make the wall encompass three sides of the fire with the opening facing the direction of the strongest wind. Yes, I said facing. The strongest wind-block is going to be provided by your body. Put you back to the wind and hunch over the candle, protecting it as much as possible. At this point it should be protected from all sides. You really have to nurse a wet fire like this one. It took ten min to get this far. Next, inside your wind break make two stacks of kindling. These stacks should be about as tall as your candle. Take some kindling about the size of a pencil and make a bridge between the two stacks. Place your candle under this bridge. At this point you are home free. The fire will take care of itself. Then, take larger pieces of wood and make a roof over your wind break. This will not only protect the flame, it will begin to dry out the wet wood. After everything is set up light the candle. Protect the flame as much as possible. As the kindling begins to light, begin stacking more and more small pieces on. You need a very hot fire to burn wet wood. Soon, the larger pieces of wood should start to smolder. When this happens, you are home free. Slowly add the large pieces to the fire. This technique will not work in a downpour, but if you have a protected area, or it is just sprinkling, it will work.